I wanted a veggie burger that didn’t use breadcrumbs, included sweet potato and is simple to make. 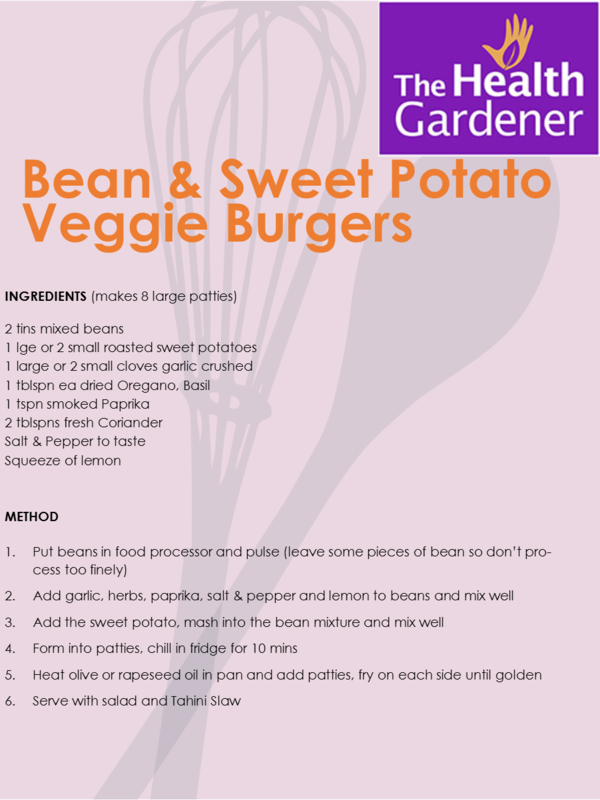 So here it is Bean & Sweet Potato burger. These are quite soft so don’t work well in a bun (however you could firm up the mixture with some buckwheat flour (if you are gluten free) or plain flour so that they could be put into a bun. As I don’t eat dairy I try to include as many foods naturally high in calcium as I can in my diet. One good source of calcium is sesame seeds. An easy way to include sesame seeds (assuming you are allergic) is by using Tahini – sesame seed paste. In this slaw I have used Tahini to make the sauce rather than mayonnaise and used some different veggies to make things more interesting. Once cooked they freeze well and just need to be refreshed in the pan before serving. You could also add some grated courgette to up the veggie content and change the herbs to suit. I always have roasted sweet potatoes in the freezer (I buy a bag and roast all of them at the same time, then once cool, put them back in the bag and freeze whole), so these burgers only took a 10 minutes to make. If you have to roast the sweet potatoes first though it will take about 40 minutes longer.